Will Valuations Spoil The Bull's Party? In spite of the escalating trade "skirmish" and a long list of purported negatives, stocks continued to trudge higher last week with the DJIA finishing at a new all-time high on Friday. The S&P 500 wasn't far off the pace, closing just 0.04% off Thursday's record high. However, for the rest of the major indices, that's where the good news ended. The bottom line is there are short-term divergences developing in the major indices as those seeing Ms. Market's glass as half-empty point out that the "troops" may not be following the "generals" at the present time. Let's start by looking at the good stuff on the chart of the Dow Jones Industrial Average (aka the original "generals" of the market)... Can you say "good times?" 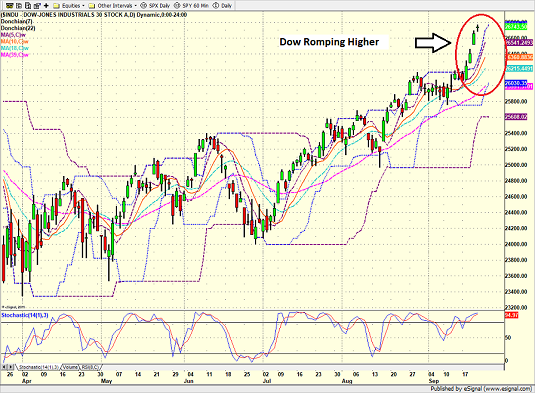 As the saying goes, the most bullish thing a market can do is make new highs. 'Nuff said. 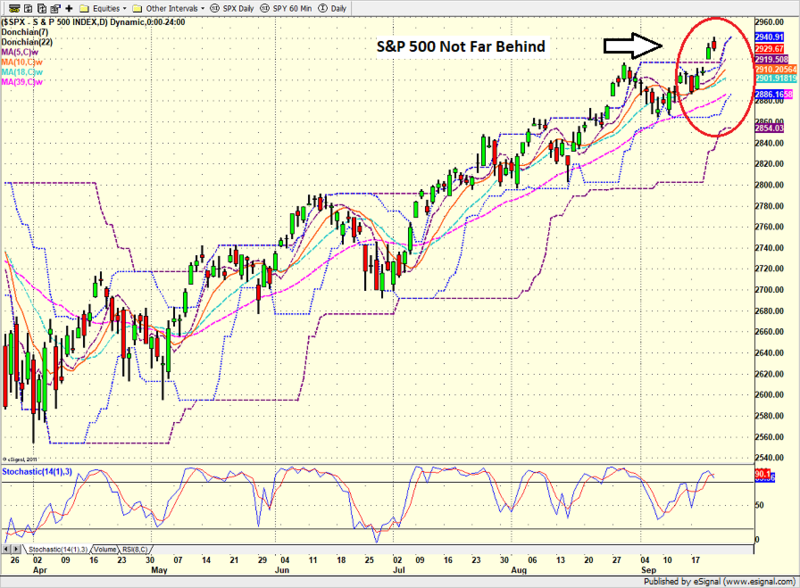 Next up is the S&P 500. While the Dow is romping to new highs, the action in the primary blue-chip index is not quite as encouraging. My take is good, but not great. Now let's move on to the "troops". 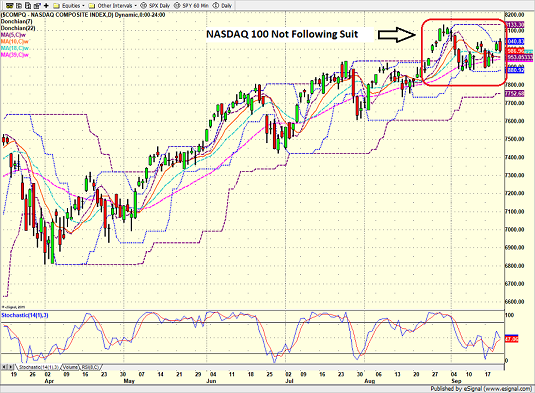 As the chart of the NASDAQ indicates, the market's long-term leaders do not appear to be following the Dow and S&'s lead. This week's sector rebalancing as well as some possible rotation away from the FANG's looks to be taking it's toll. Then there are the small-caps. When you compare the charts of the DJIA and the IJR since the beginning of September, you have what amounts to a textbook example of a technical divergence. So, the first point I'd like to make on this fine Monday morning is that technical divergences CAN become problematic for the overall market over time. Not always. But, should the current divergent trends continue, our furry friends in the bear camp suggest that things may not end well for the bulls. 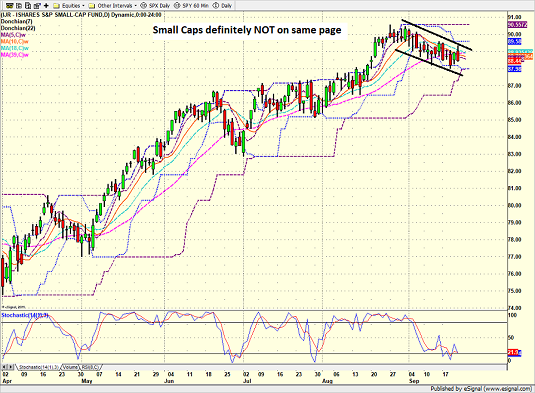 However, it is also important to note that short-term divergences are fairly common and may not last long. As such, it is probably not a good idea to run and hide at the present time due to the fact that small-caps are trending down slightly while the Dow is making new highs. Can The Bulls Keep It Going? The bulls point to the weekly charts of the Dow and S&P and ask simply, what's not to like? As such, the question of the day seems to be, how much higher can the current bull market run? Obviously, nobody knows the answer to this question. Nor will I offer up an opinion on the subject. But I can say from experience that aging bulls tend to cause the bears a fair amount of pain as they often persist much longer than our furry friends can imagine. While I'm not in the prediction business (sorry), I do believe that looking at some macro indicators can help determine whether or not the bears might wake up from hibernation sometime soon. As I opined in last week's missive, entitled The Good, The Bad, and The Ugly, the economy, earnings, the labor market, and the state of the consumer lead the list of fundamental positives. But if you asked 10 analysts to offer up their biggest negatives, I'd be willing to bet dollars to donuts that stock market valuations would be on every list. And since there has been a LOT of discussion on this recently, I'm going to spend the rest of my pixels this morning on the subject. First up, I saw several references to the Price-to-Sales Ratio last week - which I highlighted as well in last week's report. The key point here is that the P/S Ratio recently exceeded the levels seen in 2000. Yikes. Frankly, the folks yammering on about this stat are a bit late as my data shows the P/S, as well as most other traditional metrics, currently backing away from their recent highs. But, when looking at the Price-to-Earnings, Price-to-Dividend, and Price-to-Book Value indicators from a long-term perspective, there can be no arguing that all are at historically high levels. Yet at the same time, it is also important to note that these metrics have been improving for much of the year. For example, as you are no doubt aware, the "E" in the P/E ratio has been "movin' on up" in 2018. And since price hadn't really done much until late summer, the P/E ratios have actually been trending lower. As Exhibit A here, I offer a long-term chart of the S&P's GAAP P/E Ratio - which is the P/E ratio using generally accepted accounting principles instead of the traditional earnings Corporate America reports on a quarterly basis (which tend to involve a fair amount of "financial engineering" and a bunch of non-recurring stuff that seems to show up with remarkable regularity). As you can see, the recent trend of the GAAP P/E is down. In short, this is good news if you are a stock market bull. But the real question is whether the current readings are at extreme levels, which tend to give the bulls the edge, or something a bit less scary? From my seat, this is really a matter of perspective. As in, what time-frame are you looking at? In the chart above, it is clear that the GAAP P/E remains well above the "Expensive" line (as determined by Ned Davis Research). However, this chart goes back into the 1920's. And as many bulls like to say, should we really be comparing today's market with anything that occurred before computers ruled the roost? So, if you are bull or the manager of a mutual fund that, by prospectus, is required to stay nearly fully invested at all times, you may decide to change your "perspective" a bit. To something like the last 20 years. After all, 20 years is a pretty long time, right? To help with this exercise, I've outlined the last 20 years in each of the charts in blue. Now look at the GAAP P/E chart again. But this time, look only at the readings within the blue box. Voila. Suddenly valuations are not extreme. Heck, they aren't bad at all. Next up, let's look at the Median P/E ratio, which looks at the P/E of the median stock in the S&P 500. I like this approach because it zeros in on the median stock within the S&P 500 instead of using the average of all stocks. Looking only at the data contained in the blue box, the median P/E appears to be a bit above the average over the last 20 years. While not cheap by any stretch, the point is the ratio isn't in nose bleed territory either. Finally, let's look at NDR's "Normalized Valuations" Model, which looks at long-term averages of six independent valuation indicators based on dividends, earnings, cash flow, sales, inflation-adjusted P/E and trend. Looking at the entire series back into the 1920's, it is clear that stocks are currently at one of the most overvalued levels in history. And THIS is what the bears are fussing about. But looking only the last 20 years, the picture is quite a bit different. 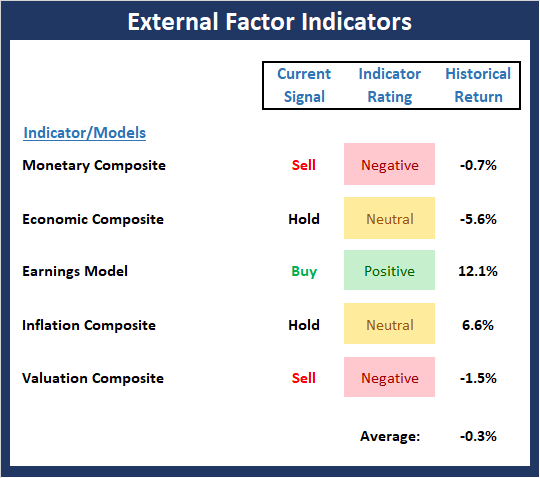 While the model suggests that stocks definitely aren't cheap, they are also not at the extreme levels that the nattering nabobs of negativism have been screaming about. There can be no arguing that the traditional valuation metrics are elevated relative to historical levels. But, depending on the time frame being used, one can argue that the market is not currently "extremely" overvalued. Frankly, this approach to the valuation subject reminds me of an old saying... "There are three kinds of lies. Lies. Damned lies. And statistics." But at the same time, there is an awful lot of money in the markets that is not "risk managed." Think about the trillions allocated to passive investing and the money that is simply automatically invested each month inside of 401K programs. This money is going to continue to be invested in stocks (well, up until it isn't, of course). But until then, I believe the passive craze suggests that another old saw may apply here: Valuations don't matter until they do - and then they matter a lot. And for now anyway, they don't seem to matter too terribly much. Party on, Wayne! 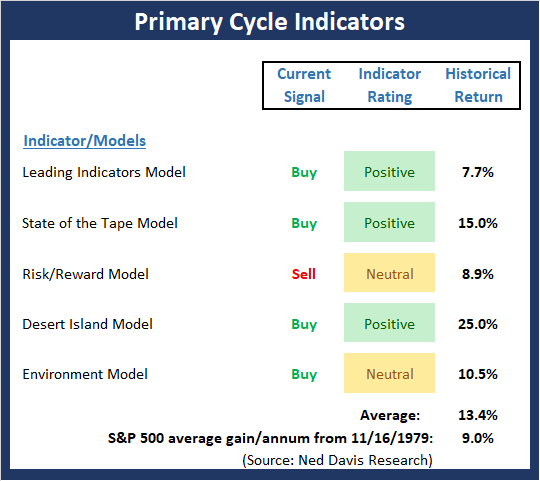 With the Dow and S&P finishing the week at all-time highs, it makes sense that the Trend Board is in good shape. The "yea, but" here is the recent action seen in the NASDAQ, mid-caps, and small-caps - which are actually in a downtrend at this time. As such, I can argue the troops are not following the generals from a near-term perspective, which is something to watch going forward. 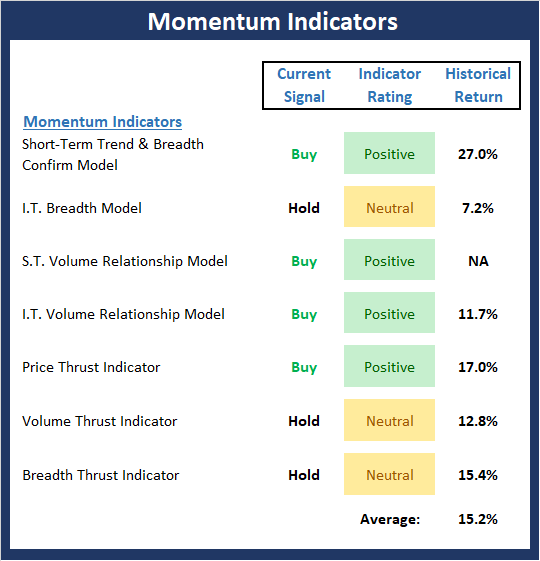 Despite the new highs seen in the blue-chip indices, the Momentum board downticked slightly last week as our Intermediate-Term Breadth model slipped into the neutral zone. This represents a slight divergence and remains something to watch as the market exits the seasonally week period in a few weeks. The message from the "Early Warning" board would seem to be one of caution. 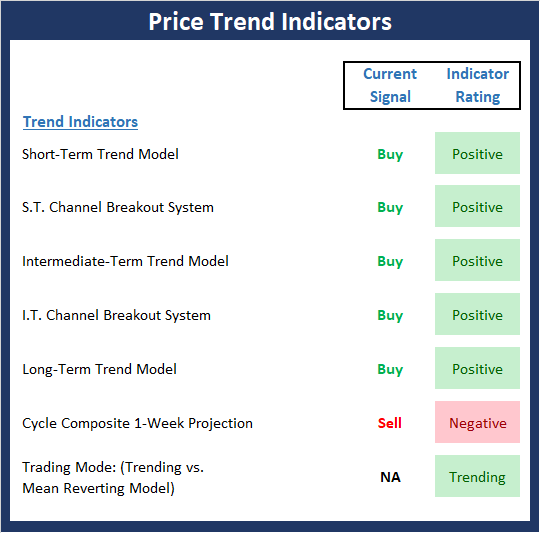 While there are not enough outright sell signals to give the bears a clear edge, the overbought condition coupled with the divergences seen in trend and momentum provides, at the very least, a reason to raise an eyebrow. The External Factors board continues to be a hot mess. The recent spike in rates has caused the Monetary Composite (a combination of two monetary models) so slip into the negative zone. The bottom line here seems to be that while earnings may be the "lifeblood" of the stock market, the external factors present the bulls with, at the very least, a significant headwind. Volume Thrust Model Explained: This indicator uses NASDAQ volume data to indicate bullish and bearish conditions for the NASDAQ Composite Index. The indicator plots the ratio of the 10-day total of NASDAQ daily advancing volume (i.e., the total volume traded in stocks which rose in price each day) to the 10-day total of daily declining volume (volume traded in stocks which fell each day). This ratio indicates when advancing stocks are attracting the majority of the volume (readings above 1.0) and when declining stocks are seeing the heaviest trading (readings below 1.0). 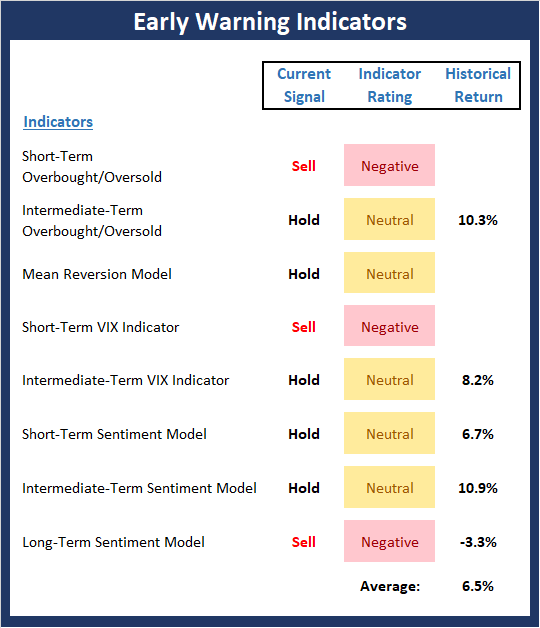 This indicator thus supports the case that a rising market supported by heavier volume in the advancing issues tends to be the most bullish condition, while a declining market with downside volume dominating confirms bearish conditions. When in a positive mode, the NASDAQ Composite has gained at a rate of +38.3% per year, When neutral, the NASDAQ has gained at a rate of +13.3% per year. And when negative, the NASDAQ has lost at a rate of -9.23% per year.